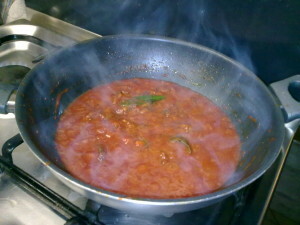 In the cold winter time the pasta can be dressed with Amatriciana Sauce. The most important ingredient of the Amatriciana Sauce is the special seasoned pork cheek named: “guanciale” its taste is unique and it is made by a special blend of spices; the Italians “pancetta” or the English “bacon” are completely different: please note that I know that the “guanciale” is not always available in your place so it is easier for you to use “pancetta” or “bacon” to make this sauce; it will be very good for your pasta but it will be “amatriciana style” not the original “Amatriciana Sauce” which I am going to describe to you now…. 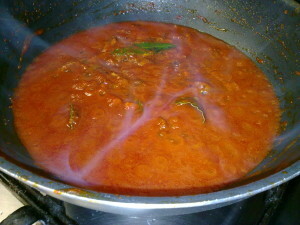 Other ingredients could be added if you like or need: chilly pepper, black pepper, onion, carrot, parsley etc. 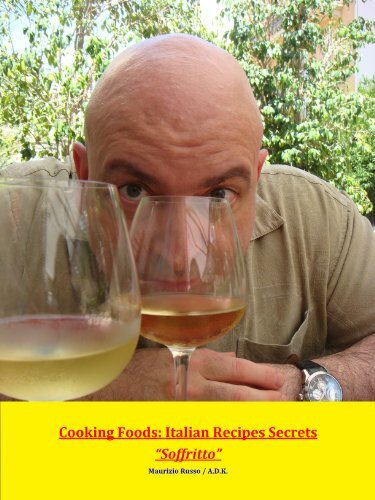 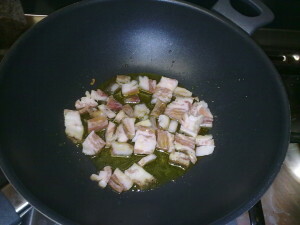 Start frying the “guanciale” in 1 or 2 spoons of E.V.O. 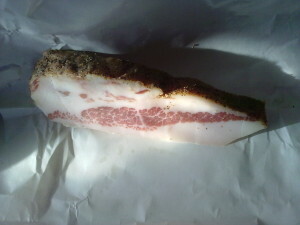 The “guanciale” takes a golden color. 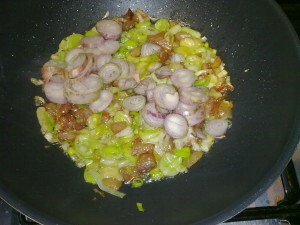 Cut the leeks and drop in the fry-pan. 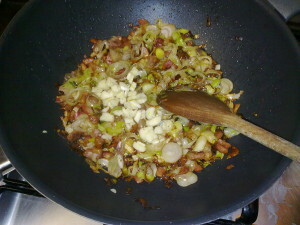 Let the leek to fade. 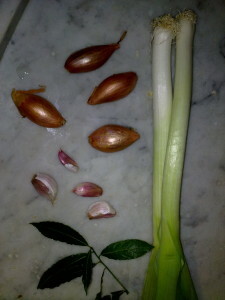 Drop the scallion (cut or chopped). 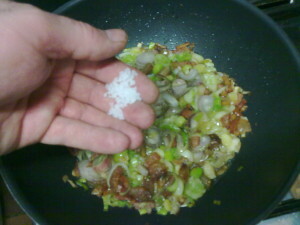 Add a pinch of marine salt. 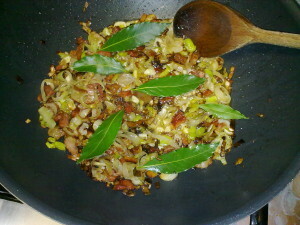 Add the laurel leaves too. 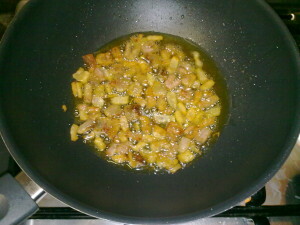 As the garlic take a yellow color add half glass of white wine. 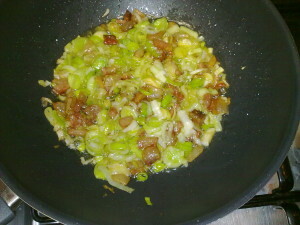 in the meantime scallion and leek get a darker color. 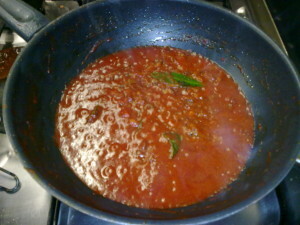 Add the tomato juice, let cook for five to eight minutes to reduce the sauce. 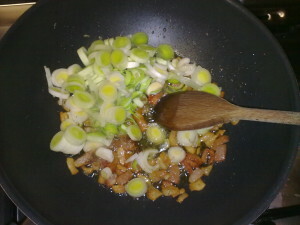 Remember to stir the sauce as necessary. 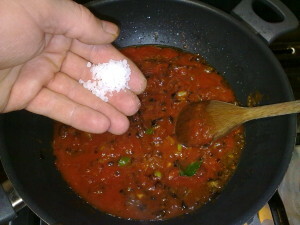 Check the salinity and, if needed, add another pinch of salt. 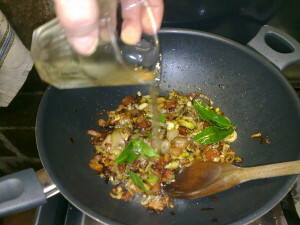 Stir and let the sauce to reduce. 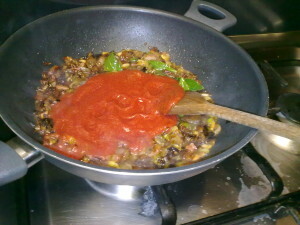 Before to complete the sauce you should check again the salinity and adjust it accordingly to your personal taste.